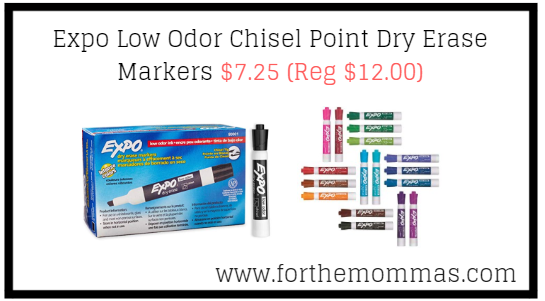 Amazon has Expo Low Odor Chisel Point Dry Erase Markers for $7.25 (Reg $12.00) with free shipping on orders over $25 or with Amazon Prime. Use Expo dry erase markers to track, schedule and present your point in a brilliant fashion. Intense, bold colors take center stage even from a distance.